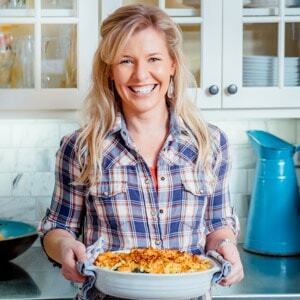 When it is really hot out, the last thing you want is to heat the house up even more by turning on the oven or stove. Amiright or amiright? 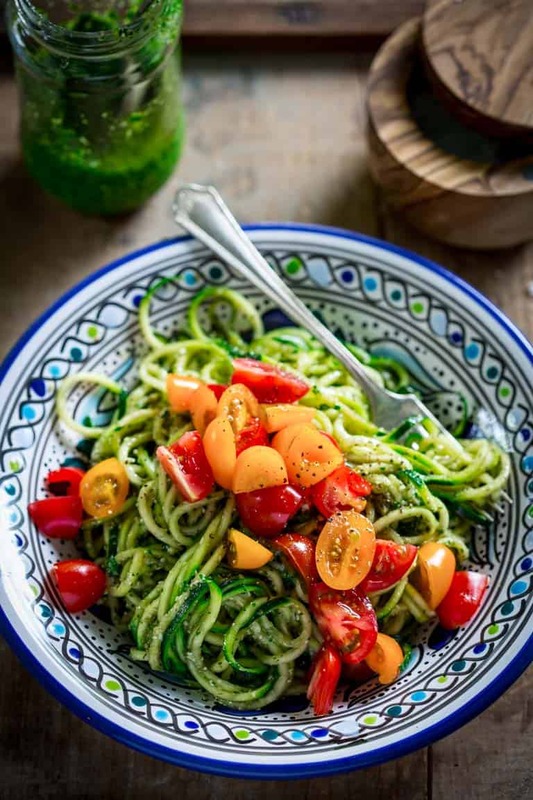 So these no-cook zoodles (zucchini noodles) are just the thing to make your bellies and taste buds happy on hot summer evenings. We’ve been staying at the lake, and I have been working from there. I’ve started taking my photos on the porch, the overhang and bushes are my light control. That’s legit, right? I have been testing cheesecake and slow roasted pork for one of my clients, but believe you me, I’ve been keeping an eye on the weather forecast. Even with the cooling effects of the breeze coming off Lake Champlain, I have only been testing on the days when I can be assured that it is cool enough. The weather in Vermont is always a fickle beast. At this time of year, one day it’s 90 and humid, the next we are in sweatshirts. Lately it’s been hotttttt. 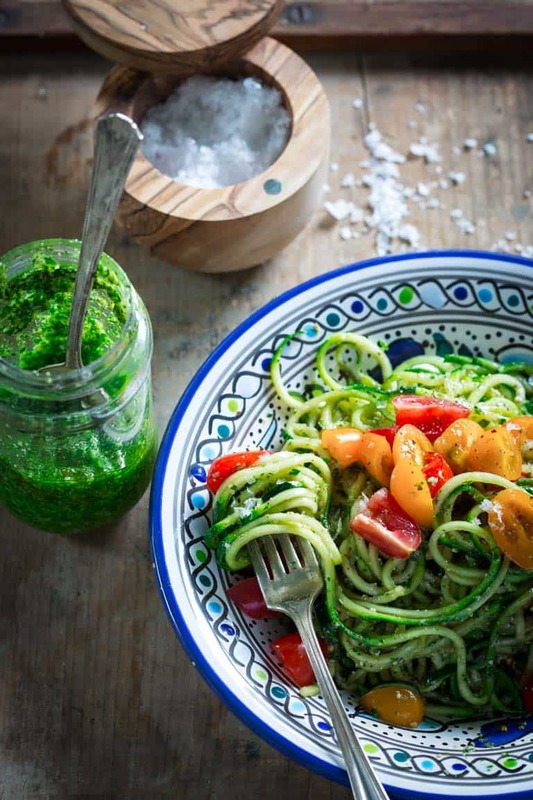 But I’ll be honest, these zucchini noodles with pesto were such a hit with me, Jase and the girls that I am planning to make it all the time no matter the temp. We devoured the whole batch in 7.5 seconds. That’s why I’ll just tell you right now, it is not a bad idea to plan on doubling the recipe. 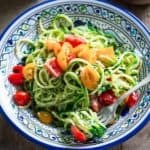 With a countertop spiralizer — The larger countertop spiralizers are the fastest way to make zoodles, and you can choose from a few blade options to make your zoodles whatever shape you want. The only downside to countertop spiralizers is that they take up a lot of storage space and they can be a little expensive. To make zucchini noodles with a countertop spiarlizer, simply cut the very ends of the zucchini off, attach it to the machine, and crank out those zoodles! With a handheld spiralizer — I’ve seen a few different handheld spiralizers at places like Target and Bed, Bath, & Beyond. They’re much smaller than the countertop ones, but they do require a little elbow grease. To make zucchini noodles with a handheld spiralizer, you’ll need to cut off one end of the zucchini and then place it in the spiralizer. Then, twist the zucchini around by hand, pushing slightly on the veg to keep it close to the spiralizer blades. With a vegetable peeler — Don’t have any fancy equipment? No problem! Whip out your trusty vegetable peeler and start shaving off slices of zucchini. 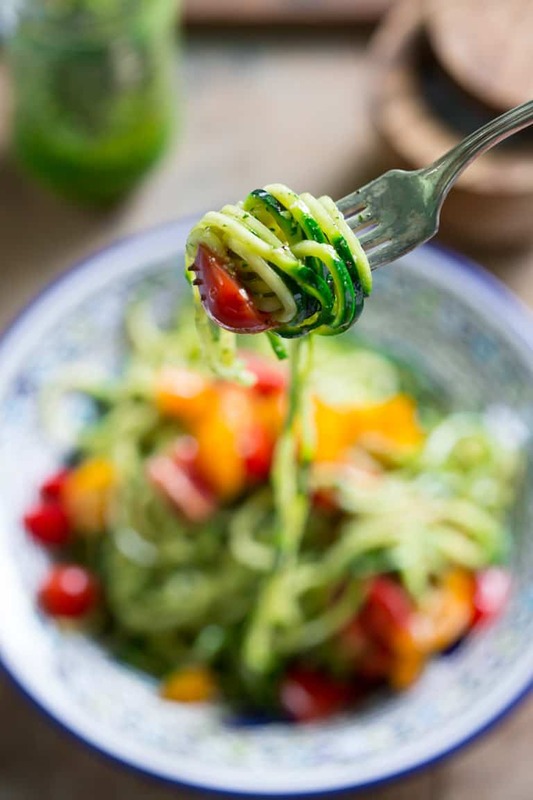 If you want a thinner zoodles, use a knife to cut the wide, flat zucchini noodles into smaller strips. The great thing about this zucchini noodles recipe is that you can make a big batch of zoodles and save them for later. Once you make the zucchini noodles, pop however much you want to save for later into an air-tight container and keep it in the fridge. 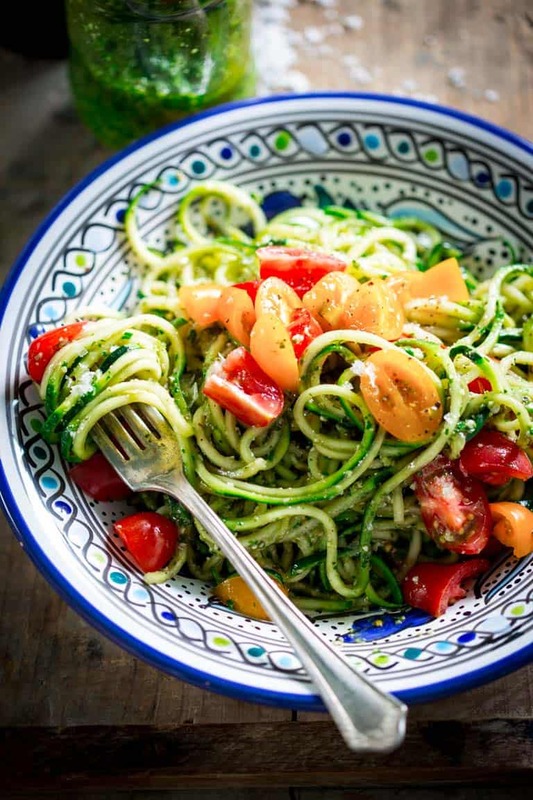 Zucchini noodles shouldn’t be frozen, and you should store the pesto and tomatoes separately (if you don’t, your zoodles will get soggy!). This no-cook recipe is essentially your main course and vegetable side rolled into one amazing dish. 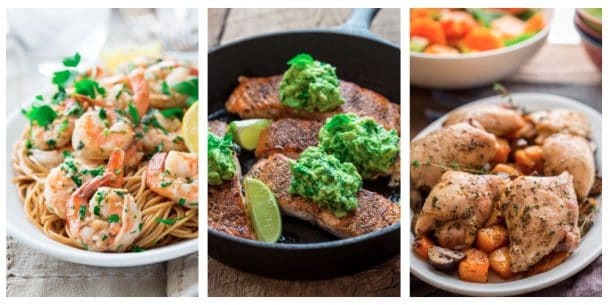 But if you want to bulk up this meal a bit, you can top it with sliced grilled chicken or another protein of your choice. For sides, a simple salad or a light quinoa dish would taste divine. Or just follow this meal with a piece of fresh fruit and enjoy not having to cook a single thing! 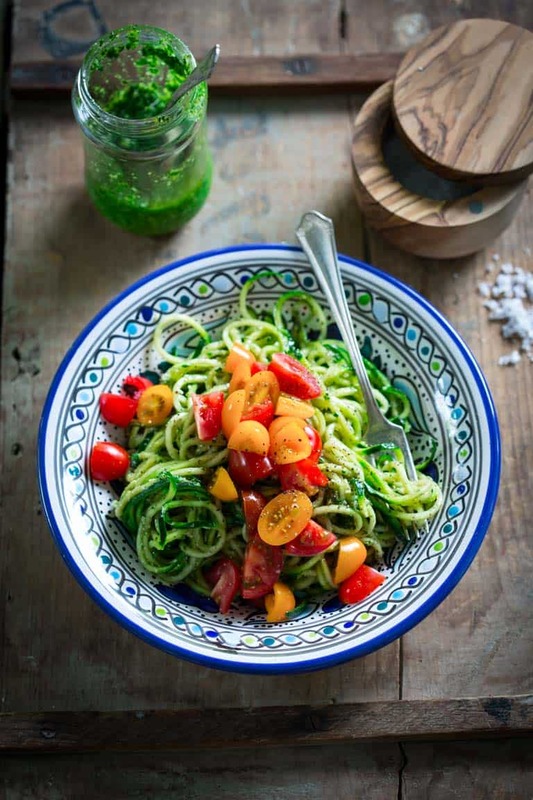 These no-cook zucchini noodles with pesto are such a breeze to whip up on a hot summer night. They are low-carb, vegetarian and primal friendly! Cut zucchini into long strands with a spiralizer. Set noodles in a large colander. Sprinkle ½ teaspoon salt on top and toss to coat. Let sit 10 minutes. Rinse and drain well, gently squeezing out the excess moisture. Transfer the zucchini to a large bowl and drizzle with olive oil; toss to coat. Add pesto and toss to coat evenly. Divide zucchini among 4 pasta bowls. Top with a scattering of chopped tomato. Top with Parmesan, pepper and Morton sea salt. I have this all the time, it is so simple and delicious and with all the beautiful heirloom grape tomatoes at the store why not enjoy the all the time. I wouldn’t mind being at the lake right about now! I’m already dreaming of making another batch. Thank goodness zucchini are in season for so many months. I think this will be my summertime staple this year. I agree, this is the PEFECT hot weather meal. No cooking and fresh and light but filling. So glad you agree Kristen. Hope you have a great day. Thank you Catherine. And that’s wonderful. Thanks for the pin. Have a great day! I love it! Simple, fresh, and wonderfully delicious! I have been making this before I saw your recipe in spring, cooking the zucchini and sometimes adding other veges before I sae your post. Now with the heat of summer coming I will make it uncooked, your way! If I want to make this for lunch the next day what do you think is the best idea – to add the olive oil and let it sort of marinate overnight OR pack the olive oil separate and throw it on before I eat? Looking forward to trying this! Either would be fine, though adding the right before serving is probably better. You will have a bit of water in the bottom of your container because the salt will continue to pull moisture from the zucchini. Pour that off, then continue with the oil, pesto and tomatoes. I mixed all the liquids together and am going to pour it over a little before I eat lunch! Also put a few paper towels in the bottom of the Tupperware so that the noodles wouldn’t sit in the excess water. I mixed all the liquids together and poured it over a little before I ate lunch! Also put a few paper towels in the bottom of the Tupperware so that the noodles wouldn’t sit in the excess water – it worked perfectly! Love the gorgeous light flavors in this dish. So refreshing! This deliciousness has my name written all over it! Would be perfect for lunch! Oh yeah. I believe you would love this one. It is so easy and so fresh. I hope you enjoy it friend. I have been devouring your paleo seed bread this week. So dang good! Hugs.